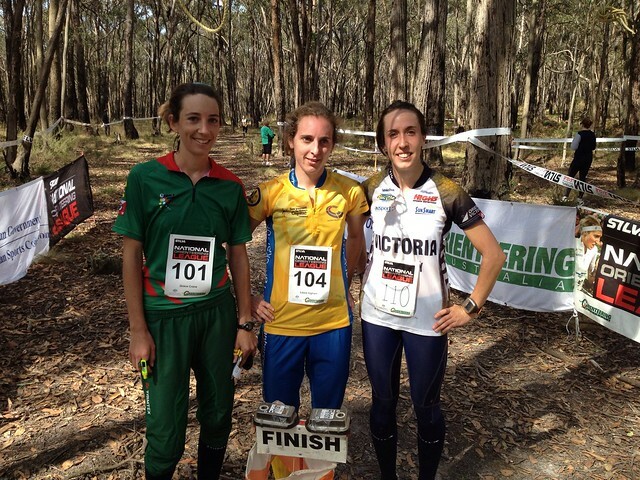 2012 SILVA National Orienteering League Has Sensational Start. The 2012 SILVA National Orienteering League commenced this weekend in Victoria. Event 3 on Sunday saw WA junior Oscar McNulty take his second win for the weekend in dramatic circumstances. Six men started the final loop of the 12.8 km Hagaby event together and despite swapping the lead often they came to the last control all together with Great Britain's Matt Crane punching first. However Oscar outsprinted everyone to win the most thrilling race finish ever seen in Australia with Matt, Bryan Keely, Dave Shepherd, Simon Uppill and Rob Preston just behind. In the women Kiwi Lizzie Ingham (running for the Canberra Cockatoo's) had a narrow 5 second win from Aislinn Prendergast with Grace Elson just 13 seconds further back in 3rd. Lilian Burrill, Heather Muir and Amy Buckerfield were the junior girl placegetters, while Ian Lawford and Brodie Nankervis filled 2nd and 3rd behind Oscar. Having the elites and juniors racing the same courses certainly was worthwhile. Ballarat University campus was the venue for race #1, with a complex array of building and passages making for tricky navigation. The courses had several loops and legs past the finish providing lots of spectator involvement. The story of the day was the amazing run from Western Australian junior Oscar McNulty who won the Junior Elite class, but also beat all the elite men. Great Britain rep and now Canberra Cockatoos team member Matt Crane was the best of the >20yo’s 9secs behind McNulty. South Australian Simon Uppill was another 20secs back in 3rd place. McNulty is now the youngest male winner of a National League race. Tasmanian Brodie Nankervis also showed great promise to finish 2nd in the Junior Elite class with Canberra Cockatoos rep and reigning Junior National Series winner Olly Poland in 3rd. Queensland Cyclones Rachel Effeney continues her stunning year with a win in the women’s elite class, just edging out NZ and Canberra Cockatoos rep Lizzy Ingham. Tasmania’s Grace Elson was 3rd, 31secs off the pace. Effeney had a great debut at WOC last year making the Sprint Final and just last month won the prestigious Sprint the Bay competition in New Zealand. In the Junior Elite women’s class Queensland Heather Muir lead from start to finish to beat team mate Lillian Burrill by 14secs. Nicola Blatchford (NSW Stingers) filled the podium, 39secs behind Muir. The competition then moved to Surface Hill, a new gold-mining map SW of Ballarat by Roch Pendergast. The courses passed through a very difficult hillside with difficult steep gullies and mullock hills left behind by the miners from the 1870’s. The Women’s Elite class was dominated by Lizzy Ingham who won by a massive 2mins 11 secs of a 4km course. Southern Arrow’s Middle distance specialist Vanessa Round was 2nd and Victoria’s Natasha Key continues beat competitors many years her junior took 3rd place. The men’s elite class was much closer. Victoria’s Bryan Keely got off to a great start and lead until the 20min mark before Canberra Cockatoo David Shepherd took the lead. Shepherd stumbled near the end to hand to lead to Matt Crane. But a fast finishing Southern Arrow Simon Uppill snatched the victory in the final few legs to beat Shepherd by 9secs. Uppill, the currently SILVA NOL champion placed 2nd in 8 races in 2011 but failed to claim one victory. Perhaps 2012 will bring a change of luck to Uppill, but the competition is likely to be very close in 2012. Thank you to Eureka Orienteers, Melbourne Forest Racers and Orienteering Victoria for 3 great races. Special thanks to Geoff Adams (Event Advisor), Roch Prendergast, Geoff Lawford, Rob Plowright, Warwick Williams, Nicola Dalheim, Dion Keech and Ruth Goddard for making it all possible.